Injectable osteostimulative bone graft paste. 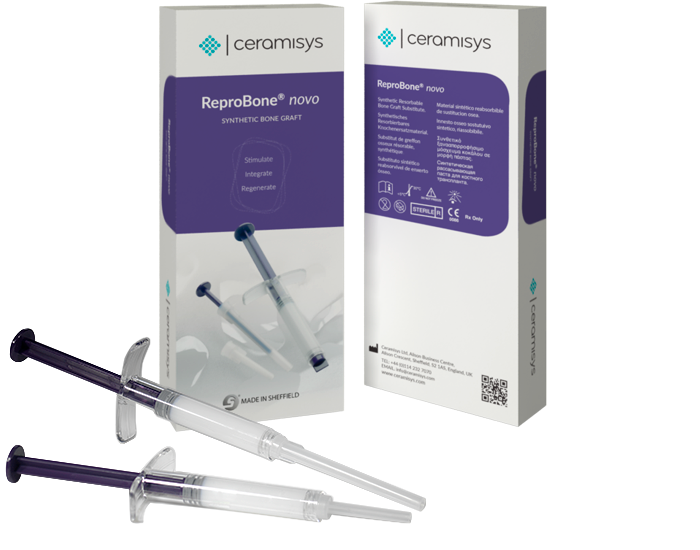 ReproBone® novo is indicated for use as a bone graft substitute for the repair of non-load bearing aseptic osseous defects and for the filling of spinal cages. Its mouldable and injectable texture is especially suitable for the filling of small or difficult to access bone defects. Injectable consistency allows easy positioning and fully adapts to the shape of the defect or spinal cage. Excellent contact with the viable bone surface maximising the bone implant interface. The paste’s cohesive texture bridges the gaps between bone surfaces and resists wash-out from bleeding of bone defects. The high molecular surface area of the hydroxyapatite (approx. 100 m²/g) is 50-100 times greater than typical bone graft technologies. It attracts the biomoloecules essential for the regenerative process and along with local elevation of ions, contributes towards its osteostimulative effect. Osteoblast colonisation and vascularisation will occur throughout the implant, promoting fusion. Cell mediated resorption of ReproBone® novo occurs over several months alongside the formation of mature bone. Easy to inject with no pre-mixing or preparation required. Simply remove the cap and apply directly into defect. Optional cannulas are provided. ReproBone® novo can also be mixed with bone marrow aspirate and/or autologous bone prior to application.